Are you a Scottsdale guru? Be heard and share your experiences by becoming an 480area.com Contributor. Learn More! Are you a local in the Scottsdale area? Join your community and Get Connected with others in your area. Join FREE! 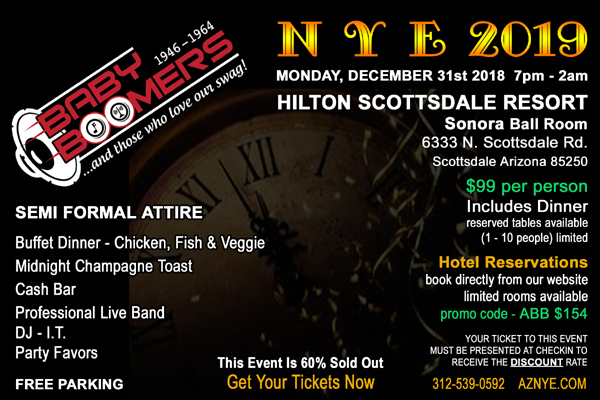 This New Year’s throwback to your childhood and celebrate your roots with the AZ Baby Boomer’s NYE 2019 Gala. Party all night at the Hilton Scottsdale Resort in the Sonora Ball Room. This year the AZ Baby Boomers have an even bigger ballroom, so you can invite all your friends and family to party with you and the other boomers. Don’t be worried about too many youngsters running around and ruining your fun, because the minimum age is Gen X and anyone younger must be accompanied by a Baby Boomer. There will be no newfangled music like Hip-Hop, just good old Motown, classic rock and soul. When you take a break from dancing, enjoy the buffet dinner with chicken, fish and veggies. There will be a cash bar as well as a midnight champagne toast. This is a fun but fancy party and the dress code is strictly enforced: semi-formal with absolutely no jeans or sneakers. Be sure to wear something you’re comfortable in so you can take advantage of the big dance floor and show off your old school moves. While you’re dancing the night away, don’t forget about the 50/50 cash raffle, one ticket is $10 and three are $20. The drawing will be at 11:45 p.m. and the raffle winner must be present. They will keep the party going well into the night, so make sure to have fun responsibly or book a room at the Hilton’s sister location The DoubleTree Resort about a mile away, complimentary shuttle service is provided. The discounted room rate is $154 when booked directly from the Arizona Baby Boomers website with promo code ABB. The room rates will be honored for three days from Dec. 28 through Jan. 3. Tickets are $99 and are selling fast! 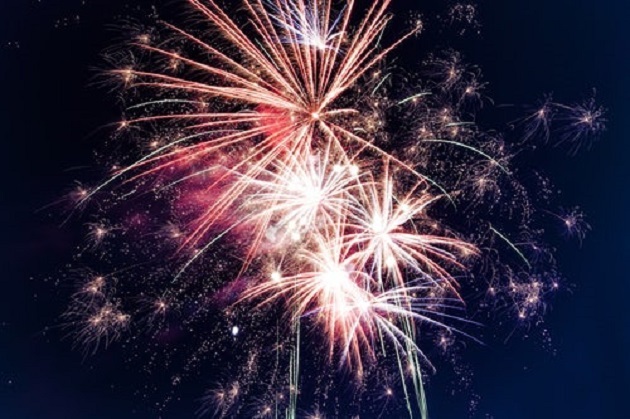 Last year’s event sold out, so be sure to get your tickets for the only Baby Boomer New Year’s party in Arizona now and dance, dance, dance into 2019.